Agilent Technologies have introduced the 81150A pulse function arbitrary noise generator with a new pattern generator, which can test analogue, digital and mixed signal devices. 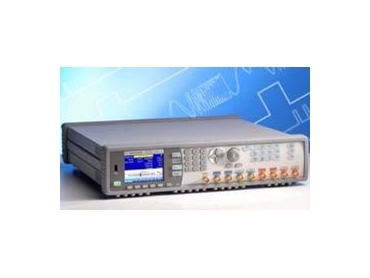 The Agilent 81150A pulse function arbitrary noise generator with a new pattern generator is suitable for general purpose bench tests as it is integrated in one instrument, providing a smaller footprint and reduced test time, therefore improving productivity for manufacturers of computer and communication devices. Simplification of important research and development tasks is critical to speed up design cycles. The Agilent 81150A pulse function arbitrary noise generator with a new pattern generator is designed for good signal generation to simplify debugging, characterisation or compliance tests whether it is applied for sinusoidal jitter or a distorted PRBS. The pressure for fast cycle times in high-quality product development requires new, more efficient test approaches. With its reliable and repeatable measurement capabilities, the Agilent 81150A pulse function arbitrary noise generator with a new pattern generator helps research and development engineers focus on design and debug instead of spending time on test setup. The integration in one instrument minimises cabling, space and test time, and therefore improves productivity. And, especially for mixed signal devices, it is no longer necessary to use a function or arbitrary waveform generator and a pattern generator. Agilent Technologies' new pattern generator also supports the new bus standards, such as Flexray, with three level signals, initialisation sequences and long patterns. The distortion capabilities of the pattern allow simulation of worst-case situations and provide a new class of tests. The pattern generator supports each development phase for sine waves up to 240MHz, pulses up to 120MHz, 14-bit and 2GSa/s arbitrary waveforms and PRBS up to 231.